The surname comes from the Irish Ó hEidirsceoil, grandson of Eidirsceol (from eidirsceol, meaning "go-between" or "bearer of news"). The original Eidirsceol from whom descent is claimed is reputed to have lived in the mid tenth century. The name is one of the very few to be clearly identified with the Érainn, or Fir Bolg, Celts who were settled in Ireland well before the arrival of the Gaels. Although the evidence is sparse, before the eighth century A.D. what is now Co. Cork appears to have been populated mainly by tribes of Érainn descent, including the Corca Laoighde tribal grouping of whom the Uí hEidirsceoil were the chief family. Baltimore was the seat of O'Driscolls. From the twelfth century, the Annals describe the O'Driscolls as kings of the Corca Laoighde. A further indication of their power comes in their inclusion in the Gaelic genealogies; although they were not ethnic Gaels, a lineage was produced for the family to connect them to Lughaidh Laidhe, a supposed descendant of Milesius, the progenitor of the Gaels. Such was respectability in medieval Ireland. However difficult the path has been over the centuries to survive and thrive through generations of conflict, conquest, persecution and starvation, the O'Driscolls have managed to hold on to their heritage and to spread the name around the Globe. Indeed, the name O'Driscoll is likely to be found in every occupation in every country around the world. In Ireland itself, it is still the prevalent name in the area of Baltimore, Cape Clear Island and Sherkin Island. In 1961 the Clan members of Baltimore, County Cork held a large Gathering to bring back together as many of the wide-spread O'Driscoll Clan as possible. Although this Gathering was quite successful, it was not until 1985 that a long-range plan was implemented to reunite the O'Driscoll Clan. The first major Clan Gathering in years was held in 1986. The position of Clan Chieftain was re-established at that time and has been passed every few years to a new Clan member to lead the tribe. A Clan Gathering of O'Driscolls and Driscolls from around the world takes place each year during the last full weekend of June, and the Clan encourages the reconnection of long-lost family ties through the formation of branches of the Clan in other countries. Currently there are web sites for The Driscolls of the United Kingdom, The Driscolls of Australia, and the Driscolls of Canada. It is the vision of the O'Driscoll Clan Chieftain, and all of the Clan Members, that this network will continue to grow and that individual family histories and genealogical information will continue to be shared until such time as the last piece of the puzzle has been fitted into place and the O'Driscoll Clan is made whole again. This is the legacy we will leave to all of our descendents. Since 1986, the position of Clan Chieftain has been continuously held. 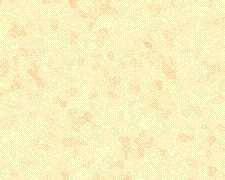 The following are members of the Clan who have served, and the dates of their terms. Just click on each of their names for a profile of each. To the right is a photograph of the official Chain of Office for the O'Driscoll Clan Chieftain. Since resurrecting the appointment of Chieftain in 1986, each Clan Chieftain has had his or her name, location, and date of succession engraved in a separate link of the chain. 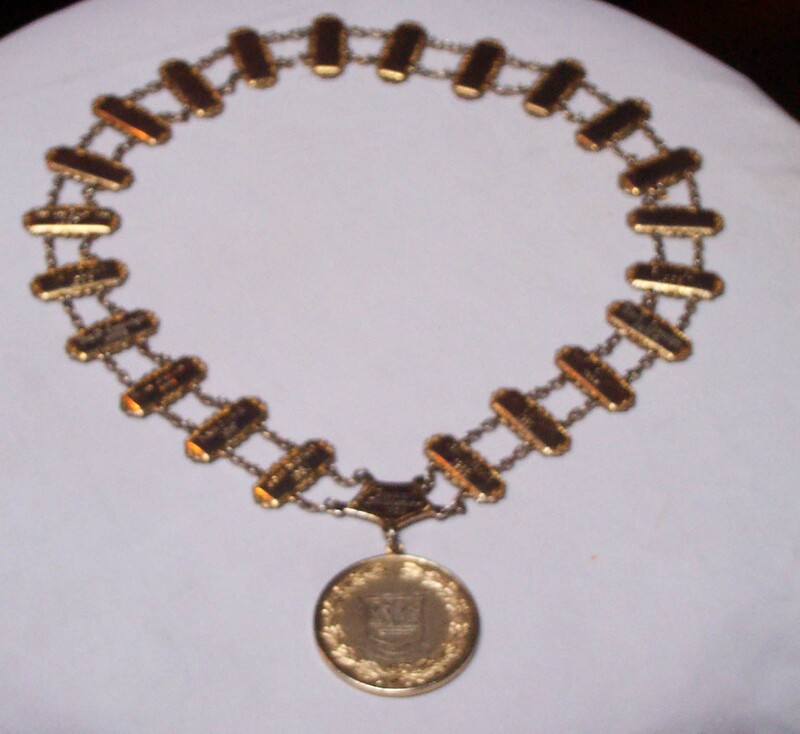 The Chain of Office is worn by the Clan Chieftain at all official Clan functions. Here we see Conchubhar in the town square of Baltimore during the 2001 O'Driscoll Clan Gathering. 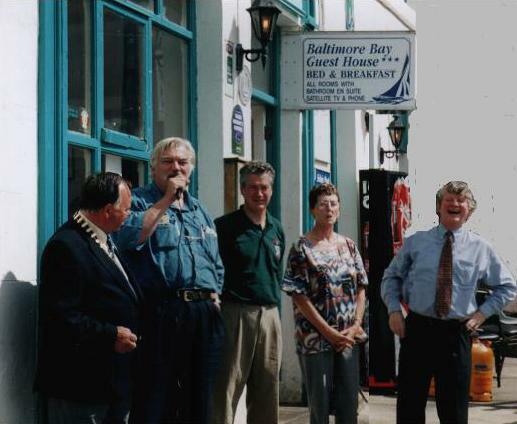 Next to him, from left to right, is Youen Jacobs, a local entrepreneur and owner of two familiar and popular restaurants in Baltimore, Chez Youen and La Jolie Bris, Bernard O'Driscoll of Baltimore (immediate past Chieftain), and former Chieftains Bridie (O'Driscoll) Murphy of Sherkin Island and Seán O'Drisceoil of Galway.